We seem to be eating our way through a small fortune in granola lately. Sometimes it makes its way into the breakfast hour, but most often it's simply sprinkled over some Greek yogurt as a super tasty afternoon or late-night snack. And while I'm certainly no expert on this mixture of oats, nuts...and stuff...I do know what I like and what I don't like and, as a result, I've (we've) become quite picky. With granola...go figure! It needs to be subtly sweet (not candy sweet); it needs to be toasty and crunchy (not over baked, or so rock hard it makes you think about your dental coverage); it needs to have enough oil and sweetener to bind it together and make it tasty (not so much that it's overly saturated and/or turns to brittle); and, it needs to have a nice mix of nuts and dried fruits that are cooked to perfection (not to an unbearable chewiness). 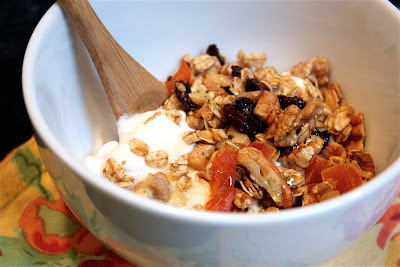 Given the abundance of granola that we seem to be going through, and the loads of nuts we recently received from my folks, homemade granola seemed like the obvious next step. This particular batch is my second in recent weeks, and an adaptation from a Nekisia Davis (Early Bird Foods) recipe. While that first batch was tasty, the recommended baking time resulted in a slightly over-baked granola, and the suggested amount of oil resulted in a very wet mixture that seemed just a bit oilier than necessary. So, with a few adjustments, the second batch is much closer to meeting our very picky specifications. The fun part about making homemade granola is you can be picky...adjusting ingredients and adding flavorings to suit your own tastes...as picky or particular as they may be. 1. Preheat oven to 300 degrees F. Line two baking sheets with parchment paper. 2. 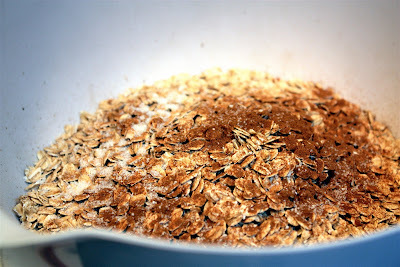 In a large mixing bowl, combine oats, cinnamon, and salt. Set aside. 3. In a medium bowl, mix three-quarters of olive oil*, maple syrup, brown sugar, and vanilla, until well combined. 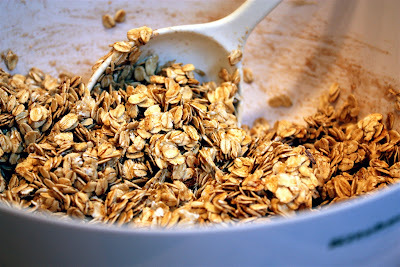 Add mixture to oats and stir to coat, folding over and over, until oats are well coated with syrup mixture. Next, stir nuts into oats and mix thoroughly. (*If it doesn't appear like nuts and oats are well coated, drizzle in a bit more maple syrup and/or oil...careful not to over saturate mixture). 4. Pour mixture out onto parchment-lined baking sheets and place in oven to bake for approximately 30 to 40 minutes. WHILE BAKING, TURN EVERY 10 MINUTES TO ENSURE EVEN BAKING. 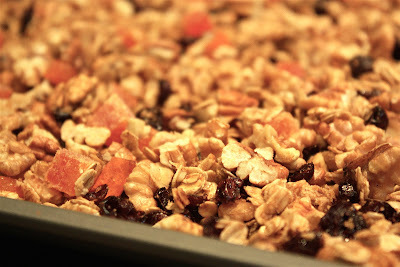 AT 20 MINUTES, ADD IN DRIED FRUITS...AND WATCH CAREFULLY FOR LAST 10 MINUTES+ OF BAKING TO AVOID BURNING. (I found the granola to be perfectly golden at 30 to 35 minutes.) When done, remove pans from oven and let cool completely. 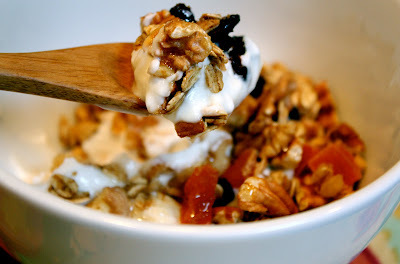 Once completely cooled, break up granola and store in an airtight container, at room temperature. It will stay fresh for up to 2 weeks.